Number of Pages: 304Scroll down for the giveaway! I seriously thought about taking this book with me on my recent trip to Missouri. After reading the first couple of chapters, I decided no, because I might start craving a margarita and Missouri would be the last place to get one. Well – I was wrong on margarita’s being in Missouri, but I was not wrong that the book would make me want margaritas – in a good way! Lenny, the tiny Chi almost takes center stage in this cozy little murder mystery set in the Big Bend region of Texas. While Broken Boot, Texas may not exist in real life, it can parallel so many small Texas towns where family is always a rock and there is always a highly recommended local restaurant to eat at. Josie Callahan is a local reporter and part-time waitress who has a desire to become a crime reporter. Lenny is her dog and is always by her side. 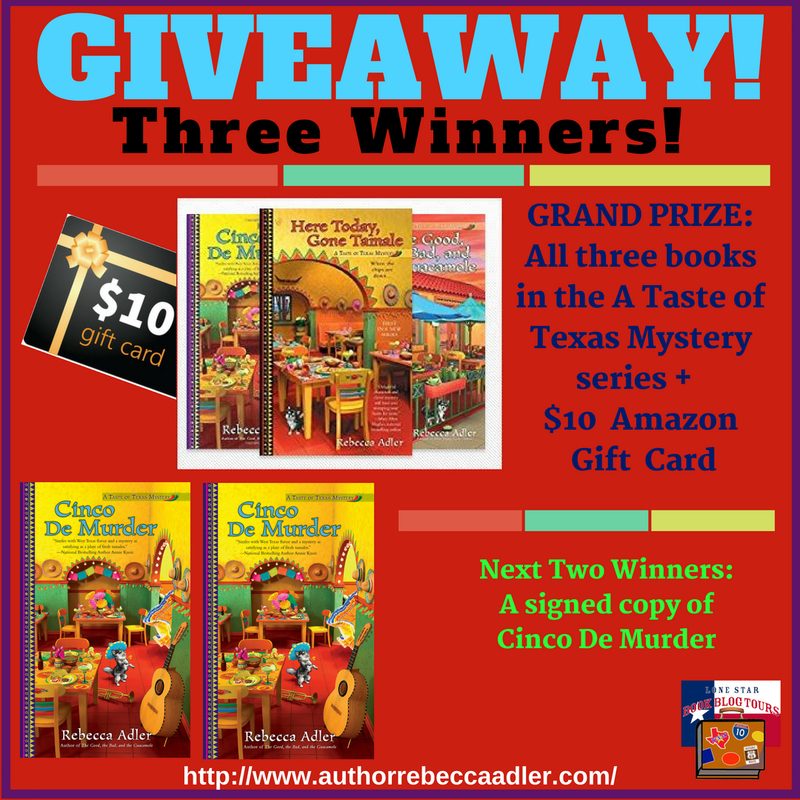 In the midst of celebrating Cinco de Mayo, a murder occurs before the big chili cook-off. Solving the crime puts Lenny’s life in peril. What’s so cool is throughout the book you get glimpses of small-town Texas life and how it would be nice if the council people of towns did ride in parades because it would make them seem more human. My only regret while reading Cinco de Murder was the lack of the proper refreshments. It would definitely be best with salt-rimmed margaritas and a bowl of warm chips and salsa. 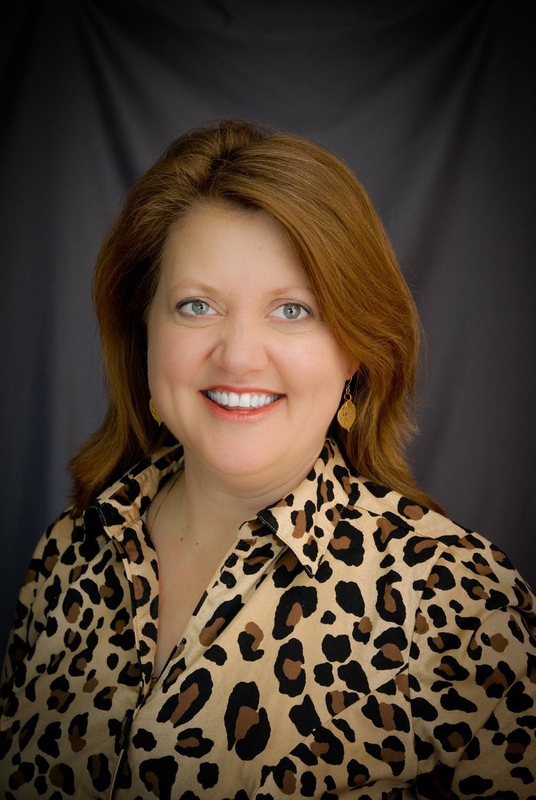 I like how Rebecca Adler added authentic touches of the bison herd at Caprock Canyons and mentioning how cell service is very spotty in rural areas of Texas, just to name a few. As a side note – the bison herd at Caprock Canyons is a must-see for any Texan or visitor to Texas. If you’ve got a knack for cooking, there are some pretty authentic recipes in the back of the book if you’d like to try your at hand them. I think I need to try Josie’s Baked Jalapeno Poppers. I may be off to the store. 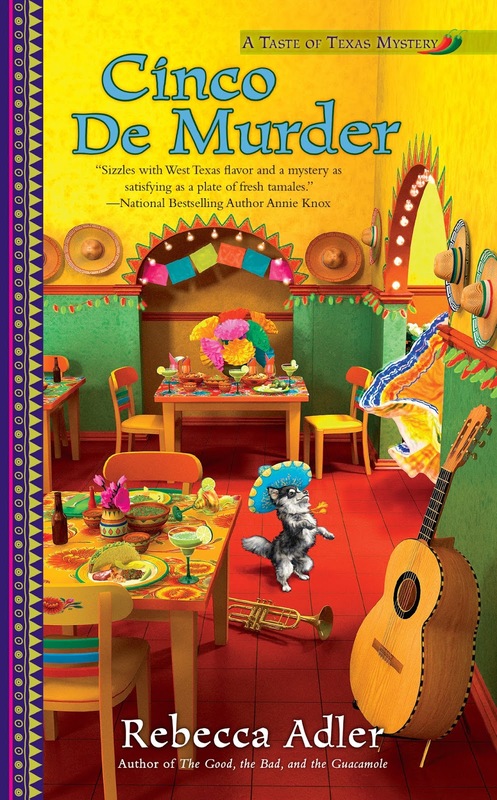 Cinco de Murder was a perfect little summer mystery book with twists and turns, plus it has a dog. I’m always a sucker for a dog in a book. Thanks, Rebecca for making a memorable story. Great review! I want to read this book even more now (and am craving Tex-Mex, too). Sounds like a delicious read! Thank you, Kristine! Yes – this book does cause food cravings, along with margaritas. Thanks, Forgotten Winds, for featuring Cinco de Murder and for your lovely review. You’re welcome, Rebecca. Thank you for being apart of the Lone Star Blog Tour. I truly enjoyed Cinco de Murder and need to read the rest of the books. Someday, I hope to get the books autographed.